Crowded shelves in refrigerators often have unpleasant surprises lurking in the hard-to-reach corners behind newer groceries. Past the rotisserie chicken and unopened almond milk could be last week’s leftovers or last month’s pizza. Stinky meats and petrified casseroles are easy enough to deal with: You toss them into the trash. But other foods fall into an edible gray area. If you have a block of cheese that’s developing a tiny bit of mold in a corner, should you toss it, or simply excise the moldy portion? NBC recently spoke with Robert Gravani, a professor of food science at Cornell University, for clarification. According to Gravani, hard cheeses like cheddar can safely be consumed even after a little mold has started to appear, provided you make liberal cuts around the spot of mold growth—an inch or so past visible signs of spores. Don’t let the knife touch the mold (it will contaminate the trimmed section if it comes into contact with it) and toss the suspect portion into the garbage. If the cheese is soft, Gravani suggests discarding the whole thing, as mold may have penetrated the entire wedge. While you can perform relatively safe excision of mold on cheese blocks, mold on bread is another issue entirely. It might seem safe—mold on one slice might not even be touching the rest of the loaf—but bread is too soft to put up much of a defense against spores. They can easily travel through the dough, leaving roots invisible to the naked eye, so it's best to get rid of the entire loaf. Mold on other foods can often be trimmed, provided the item in question is made of sterner stuff than yeast. Vegetables like cabbage, carrots, and bell peppers are more resistant to mold spreading. Lunch meats and cooked leftovers are the opposite: Because they’re full of moisture, mold can spread rapidly. If you do unintentionally consume mold, it’s not usually the end of the world. 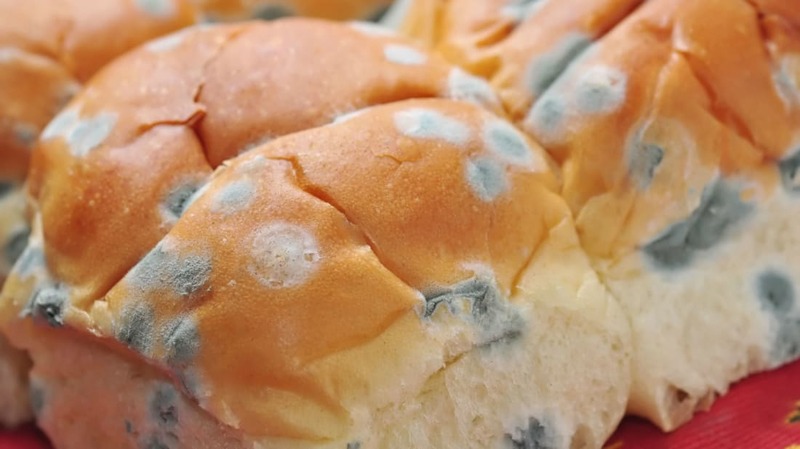 The types of mold found in grocery items might provoke nausea, vomiting, or mild allergic reactions, but it's unlikely you'll need to seek medical attention. Just don’t think toasting bread will kill the spores. (It won’t.) And if you do see mold on food, don’t confirm your finding by holding it up to your nose for a sniff. Inhalation of mold spores can prompt respiratory problems. If the Gouda looks suspect, trust your eyes and prepare it for surgery.